My Twitter timeline has been filled for the last day or so with #IamGreen tweets stating why people are choosing to vote for their BC Green candidate in our provincial election on May 9. I have debated participating in the fray, partly because I have a number of staunch NDP supporters in my timeline who I adore and respect and do not want to offend, and partly because how I vote is no one else's business. Mr. Green didn't even ask me who I voted for, and he's a politician! But I've had more than one "Vote NDP or else" type ad directed at me, and, frankly, I'm over it. Here's what the pundits won't see on May 10 when they sit down to analyze the 2013 v. 2017 voting results and I show up (anonymously in what I assume will be a blob of X number fewer NDP, Liberal and non-voter votes to X number more BC Green votes): the BC Greens didn't steal my vote from the NDP. The BC Greens gave me something to vote FOR that kept me from not voting at all. This is the only election since I first voted in 1986 that I have considered sitting out entirely. Yes, I voted NDP last time around, and I imagine they thought I would this time. I'm betting that voters are like donors and it's easier to hold on to them than to get new ones. In 2013 I knew my NDP candidate and respected her work, so I voted for her. That does not give the NDP a lifetime right to my vote. I've also previously voted Progressive Conservative federally (I was young and not yet thinking for myself), Liberal federally, and NDP federally. I have no idea what I've voted provincially, but I know it hasn't been for just one party. This time, the Lieberals (sp. purposeful) make me nauseous, so that leaves a 2-party race for my vote. I know candidates from both the NDP and the BC Greens and have met both leaders. I also read the BC Green's policy book (before their campaign platform was announced), and read both party platforms. I have asked questions both online and in-person of the NDP and the BC Greens. From all of that I chose based on a number of factors - direct, fully-costed, evidence-based answers were a big factor, but so was party leadership, fiscal transparency, platform costing, and the BC Greens refusal to accept donations from anyone but individual voters. The BC Greens also have an exciting policy framework on intergenerational equity that makes me think at some point my sons might have a shot at good-paying jobs, affordable education, and maybe even home ownership without having to leave BC. No one else gives me that hope. And so on the first day of advanced voting, I voted BC Green. And just like the NDP before them, the Greens do not now have a lifetime hold on my vote. They get a chance to prove themselves between now and 2021. Whether only the party leader gets returned to the legislature, or they secure enough MLAs to achieve official party status, or they (through the magic of BC politic's renowned volatility) become the official opposition or even form government really doesn't matter in terms of their hold on my vote. My vote is a trust I place on someone saying "I'll give you this 4-year chance to prove my faith in you is justified. At the end of the 4 years we'll re-assess." That's how democracy works. The NDP didn't do that. They didn't prove themselves. I have zero evidence that my current NDP MLA did anything to try to effect positive change while in office. He's a nice guy, but that's not enough. Moreover, many NDP supporters have been dismissive, insulting, rude and dishonest in trying to rally support for their party. It's so unnecessary and repellant. I have a dear friend and staunch NDP volunteer who has only focused on why she LOVES the NDP - the candidates, their leader, and their policies. She makes me stop to take a closer look. This other approach - the lying, insulting, nastiness that insinuates I'm too stupid to make an informed choice or brainwashed, or ... it's a huge turn-off. I hope you vote. Sorry, make that I hope you get informed, and then I hope you vote. And I really hope you vote FOR something you believe in rather than from fear or ignorance. And I hope you're respectful of your friends, colleagues, neighbours and family members who vote differently. We now return to our regularly scheduled navel gazing. It's one thing when your older sisters turn 50, as mine have over the past few years. "Older" is right there in their labels, not as a put-down but as a statement of fact. When your closest and 'oldest' (meaning longest serving) friends start doing so, however, it's a bit of a cold slap in the face. So happy to get to celebrate with this beauty! 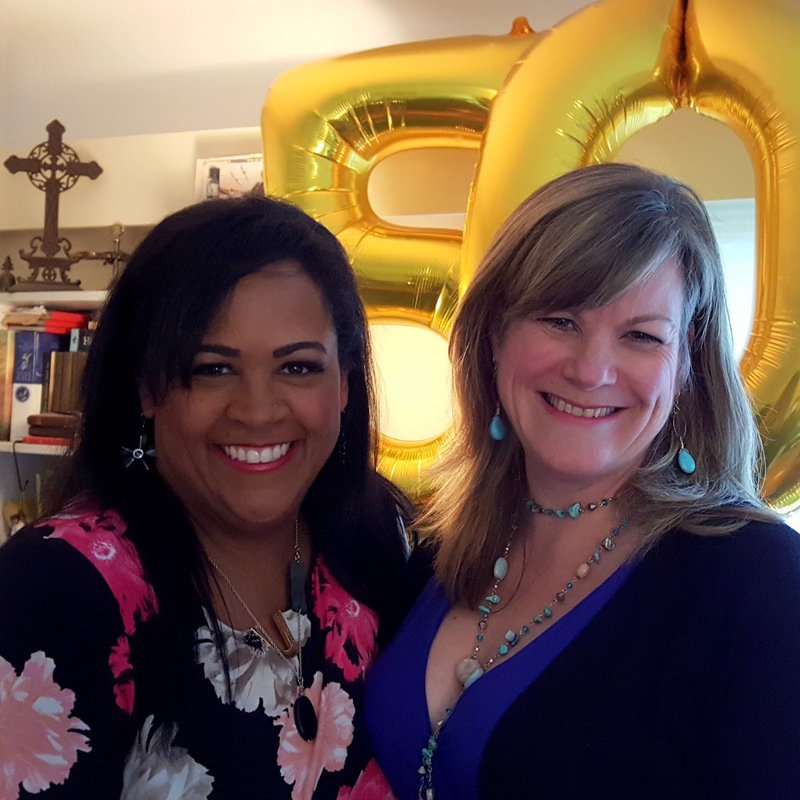 Two weeks ago my darling Diva had her Canadian 50th birthday party before whizzing off for a lovely family trip to Mexico for the actual day. Diva and I have moved in and out of each other's orbits since we were 11 & 12 respectively. However, it wasn't until we both moved to Victoria, shortly before her 40th, that we really became bosom friends. In fact, celebrations of that major birthday were the first photos I posted on Facebook. And now, suddenly, in the flash of a moment filled with love, loss, grief, near misses, dodged bullets, changes, samenesses, weight lost and gained, dreams attempted and postponed, new goals and old habits, here we are celebrating 50.
dragging us out of there. The day after the Diva's party one of my earliest chums, a man I haven't seen since we were teens, also posted about his 50th birthday party. But but but ... the last time I saw him he was 16. How can this be? 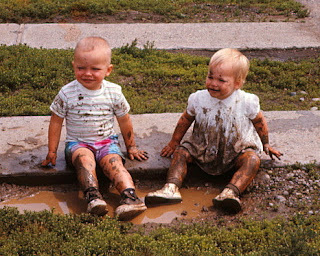 Even more confusing, how can the boy I sat in this puddle with be a father, husband, leading firefighter? How can things change so much while I still feel so ... me. It still breaks my heart that Dale didn't make it. Bobby has. The Rons will, God willing. And late next month it will be my Shiney. The day after Freckles clocks out of 50 Shiney will log into it. My other half since I was 3. My sounding board. One of two people I can tell anything. She will turn 50. And then it will be only me waiting for that milestone alone. Oh no, of course not truly alone, but without the company that has done these things with me for so long - they've all gone before. Perhaps my incredulity is a factor of being the youngest child. I never clung to my actual youth since the teen years weren't a joy for me, but there is some call of "I'm not ready" that is seeping ever louder through my daily life. Some resistance. Some feeling of loss. I question almost constantly how I've gotten this far with so many backwards steps. I feel the heavy impossibility of fixing my mistakes with so much time gone. I dread the future having wasted so much of the past. And yet the alternative, as we all know, is even less appealing. We have lost so many too soon. I know what their families would give to see them age. And honestly, this isn't so much about physical age. I'm very clear I lucked out on the ageing gene lottery. I haven't taken the care of my body that I could have, and yet 'almost 50' is not what shows in the mirror or in photos. But the creaking and the aches. The moaning cacophony of this body. Those too are a reality much like the shortening of time. It turns out I have nothing to say here. Nothing new or clever or witty. I just wanted to share this impending doom that isn't a doom at all. In fact, it's quite meaningless in so many ways. "Just a number," so they tell me. "It's all in how you feel," they console. I feel old. And I feel sorry. And, I feel oh so grateful, especially to think of all the friends I've had for lo these many years and to celebrate their milestones with them.